Maria Middlestead - Good health made pleasurable and practical with personalised advice from a multi-award winning Registered Clinical Nutritionist, Author, Educator and Speaker. Let Maria help you address ALL your health concerns - from large to small. All prices are in New Zealand dollars. This is a Secure Store – shop with ease. Payment is by internet transfer, cheque or PayPal only. For PayPal: specify this option under “Special Requests”; click on Internet Transfer (as below); and a PayPal invoice will be sent. Anyone can use this quick and easy method – no previous sign-up with PayPal is required. Please tick the items you wish to purchase, then fill in your Customer Details, preferred Payment Method, and click Submit as below. For Currency Exchange Information see the bottom of this page. Invest in yourself today and experience the good health you deserve. Following is a series of tailored reports targeting your health needs with proven and practical methods. Each report addresses a specific topic to help you enjoyably eat your way to optimal well-being. This series overall, and each individual report has a free preview. Or if you prefer a printed and posted version, then choose the "Post me the printed version" option and write in the quantity desired. How would you like it? Discover your unique metabolic and personality type - and the foods that fuel it. Paperback book: $34.95 + P&P (estimate postage & packaging). Scrumptious dairy-free and gluten-free fare to enhance your health, pleasure and longevity. For Overseas Customers Ordinary personal cheques in foreign currency are acceptable (no need to purchase a bank draft in New Zealand dollars unless you wish to). Complete your details as above. Under Special Requests state the name of your currency: e.g. "US cheque". Click "Submit" as below. Maria will reply with confirmation of price in your currency and postal details. 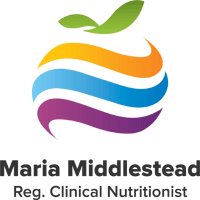 Maria Middlestead is a multi-award winning Clinical Nutritionist with more than 40 years’ experience.